The weekend drama in town that nobody seems to be talking about is none other than A Thousand Kisses, starring the popular Ryu Jin (Baby-Faced Beauty) and Kim So Eun (Boys Over Flowers). Boasting these stars, one would think that A Thousand Kisses should be doing really well in terms of ratings and audience viewership. However, the difference between A Thousand Kisses and any other trendy drama is that it is planned for a 50-episode run, not a traditional 20-episode run. That means slower character developments, slower relationship developments, and to be honest — more time spent watching a drama that may or may not be a complete waste of your time. Fortunately, watching A Thousand Kisses is like going for a light jog at the park or meeting up with old friends – it’s comfortable, but still fun. Rest assured, A Thousand Kisses doesn’t break any new ground in terms of characters, plots, familial restrictions, or crazy mother-in-law behavior, but it is quite a joy to watch. Promoted as a slightly dysfunctional romance that plays against traditional age-based dating (older guy and slightly younger girl), A Thousand Kisses has two main couples. The first is a divorced mother of one (Seo Young Hee of Bedeviled) and younger sports manager (Ji Hyun Woo of Invincible Youth 2), and the second being the already mentioned Ryu Jin and Kim Seo Eun (their age gap being much bigger — an almost 20 year gap between the two). I really like this two main couple idea. Most Korean dramas have the main male and female protagonists, and then several second lead characters competing for the love of the leads. If your favorite actor or actress ends up being a second lead, you know they will end up disappointed and heartbroken at the end of the drama. This drama avoids all that anguish and cuts straight to what’s most important — the development of the two couples’ relationship. Though this romantic set-up is rather without suspense, I wish more dramas tried something along these lines. Despite being advertised as a romance drama, I consider A Thousand Kissesalso a bit of a family drama as well, since there are many family members that are introduced who become very crucial to the storyline as the plot thickens. For those of you who are bit turned off by family dramas, fear not — there are so many family characters that your hatred for any one specific mother-in-law will not make you hate all elders in the show. If my descriptions so far has enticed you to read further, I will give you a brief synopsis of the first five episodes. Do remember, however, that the drama is scheduled to run for 50 episodes, and I probably won’t cover the drama every 5 episodes. Most likely, I drop in on the drama several more times throughout its run and update on character and plot development, and also commentate on its audience reception and how it could be improved. A Thousand Kisses starts off with the main female protagonist, Woo Joo Young (portrayed by Seo Young Hee), discovering her husband’s infidelity and personally witnessing him and his mistress passionately embracing in front of their apartment. Her husband, Park Tae Kyung (Shim Hyung Tak), is absolutely shameless, and his mistress, Yang Joon Hee (Lee Ja Young), is probably the calmest home wrecker in the world. Even after Joo Young finds out about his cheating ways, Tae Kyung continues to deny that he has any particular relationship with his mistress, and even claims that her kissing him is just simply her personal way of greeting clients. Yeah, and the moon is also made of cheese. The show’s portrayal of Tae Kyung and his mistress Joon Hee is quite ridiculous and almost comical – and unfortunately, it takes Joo Young a good five episodes to finally declare her intention to divorce him. Did I also mention that Tae Kyung has cheated on Joo Young twice before as well – once even during her pregnancy! He was too busy cheating on her to be present at the birth of their son, Chan Noh (portrayed by the adorable Goo Seung Hyun). What a despicable, good-for-nothing husband! 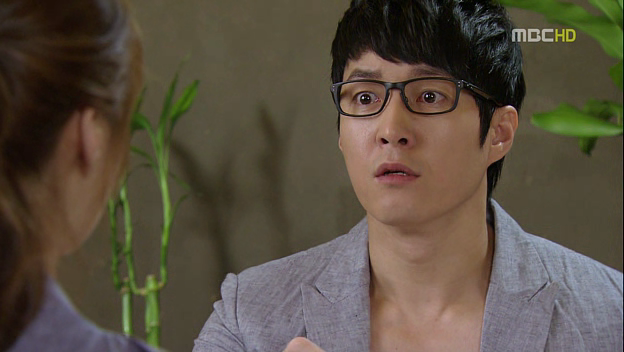 Seriously, the way Shim Hyung Tak portrays the guy makes him seem like a cartoon character. Despite the fact that his mistress called their affair ‘a hot relationship,’ he doesn’t appear to be in love with her at all. Instead, the only time we see him go up in arms is whenever Joo Young threatens divorce. He bought her her favorite flowers the day she found out he cheated on her for the third time. He thought flowers alone were enough! Oh, how I pity the simple minds of cheating men. The unfortunate cheating pair aside, I really love the character of Jang Woo Bin (Ji Hyun Woo) – Joo Young’s counterpart. The cool thing about knowing that the two of them will end up together in the end is seeing how the two start off at the beginning of the drama. And at the beginning of the drama, their fateful meeting could not have been worse. Joo Young is teetering on the verge of emotional collapse due to her husband’s cheating ways, and Woo Bin, at first, is far from sympathetic. Joo Young ran into Woo Bin while he was carrying a large expensive pot, and as a result, he dropped it, causing it to break. He wanted nothing more than to get the compensation money from her, and she wanted nothing more than to be left in peace. However, as the drama progresses, the two start to develop fond feelings for each other. The other romantic pair, Ryu Jin and Kim So Eun, is a lot less developed within the first five episodes, and though it is fair to say that they are definitely the second (not main) romantic pair, they are the far more popular pair. I have to be honest and say that I sort of hate Ryu Jin’s character in this drama. I first saw Ryu Jin in Baby-Faced Beauty (with Jang Nara) and there he was a cold, taciturn boss. Here he is cold, taciturn, and a jerk. Not to mention a workaholic. In this drama, he is 35 years old and so engrossed with his work that he has not even had the time to date anyone. Sorry to be hating on Ryu Jin, but I really hope his character steps it up a bit and becomes a likable, redeeming character I want to root for. Kim So Eun, on the other hand, portrays Woo Joo Mi, an effervescent, always optimistic and cheerful girl. Noticed the similar name with Joo Young? They’re sisters (this drama is all about familial relations). Joo Mi is running along the Han River and happens to run into Ryu Jin (no pun intended, and I actually do mean literally run into), from which point she falls head-over-heels in love with him. And proceeds to stalk the hell out of him. Just kidding, but if they had Facebook in the realm of dramaland, she would be the first to Facebook stalk him like crazy. Anyway, she’s crazy (in love) enough even to visit him at his work place to thank him for saving her from falling into the Han River, and he has the audacity to call her a gold-digger, because she visited him at work twice. What the hell? Drama writers, get it together. Thankfully, Woo Jin (Ryu Jin’s character) is forced into an arranged date by his family (who worry he will never marry – I would worry too; the guy is as emotionless as a rock) and in order to get out of it, he pretends to have a woman he already loves. Who better to show up at the right time than Joo Mi herself? And his family want to meet her! So that means Joo Mi will have plenty of opportunities to role-play as the woman Woo Jin “loves,” and hopefully in time, role-play will turn into real-life. For Joo Mi – the most adorable pathetic girl character in the drama – that would be a dream come true. 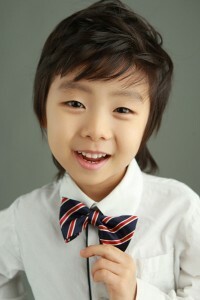 It would be unfair not to mention Joo Young’s son, Chan Noh. For me, he is the very reasonably portioned icing on the cake. The little boy who portrays him is absolutely adorable, and every time I see him on screen (usually when Joo Young’s patience is being tested), my frustration for the situation automatically melts away. Plus, when Chan Noh shows up, Woo Bin (who I prefer over Woo Jin, sorry girls) inevitably follows. Chan Noh is a soccer fanatic, and Woo Bin is a former soccer star – I can foresee the two becoming great friends. Or perhaps, Woo Bin will adopt Chan Noh? That would be the cutest thing in the world and I’m not sure I’d be able to stand it. The only thing about this drama that’s giving me a bit of a headache is the 50 episode number. I think to myself, can I commit to almost 50 hours of the same drama? Most of the time, the answer would be no. I can’t imagine watching the same bland, recycled characters with no chemistry try to stick it out for 20 episodes, let alone 50 episodes. However, there’s something endearing and familiar about A Thousand Kisses that I can’t quite put my finger on, but I’m decently hooked so far. I’m a bit disappointed the drama isn’t receiving more press and attention, but maybe it will remain one of those little gems that go unnoticed under the radar. I, for one, am excited to see how the two relationships (along with the side relationships) develop. Stick it out with me? Tell me your thoughts about the drama so far in the comments below!